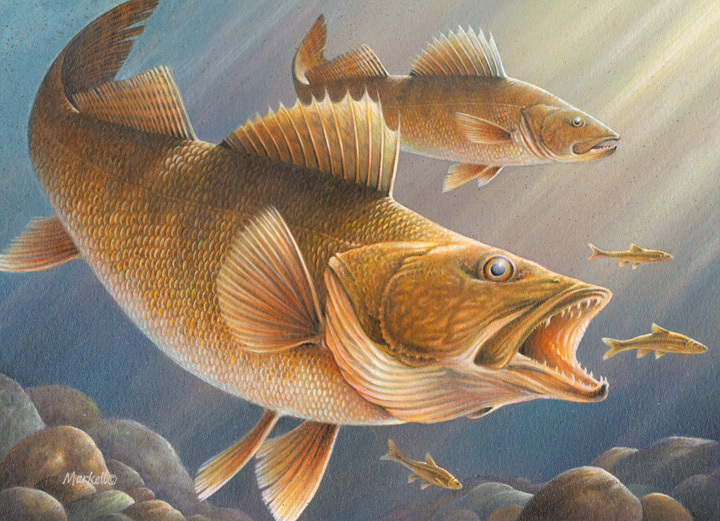 A painting by Nicholas Markell of Hugo, which shows a walleye chasing a minnow, will be featured on Minnesota’s 2013 walleye stamp, according to the Minnesota Department of Natural Resources (DNR). Markell’s design was selected from among nine entries. This is the second win for Markell in just over a year in a DNR-sponsored stamp contest. He also won the 2012 trout stamp contest. Markell, who has participated in several DNR stamp contests in the past, has been a finalist many times, finishing third in last year’s walleye and turkey stamp contests. Three entries made it to the final stage of judging during the walleye stamp contest at DNR headquarters in St. Paul. Contest judges were Spencer Green, Outdoor News; Lisa Laliberte Belak, art publishing and production expert from Roseville; Mark Tipler, Tips Outdoors Foundation; Al Stevens, DNR fisheries; and Jason Abraham, DNR wildlife. The Legislature created the walleye stamp in 2009. It adds $5 to the cost of an angling license for those who choose to purchase it, although it is not required to legally catch walleye. Revenue from stamp sales is used to purchase walleyes to be stocked in Minnesota’s lakes. The 2012 walleye stamp is still available for purchase at all license vendors.